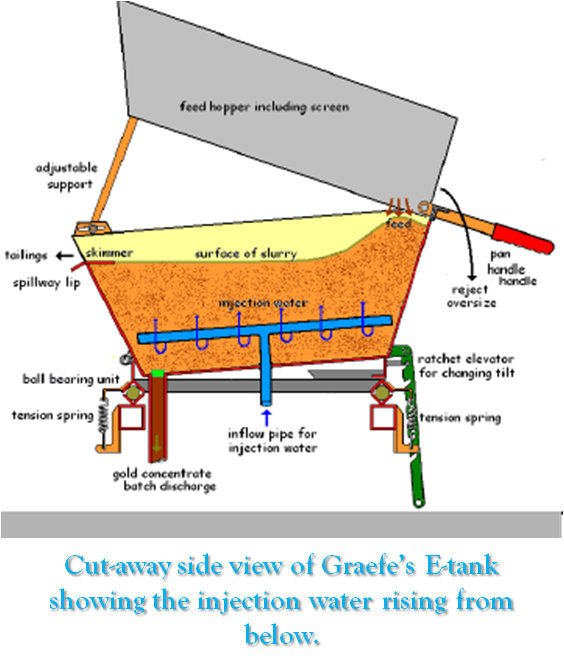 Graefe’s E-tank was invented by Ralph Graefe of California and patented in 1985 (US #4,523,989). Rightswere transferred to Keene Engineering Inc who sold it as the ‘Keene Hydromatic Jig.’ This is a misnomer as it lacks the key features of a jig. Graefe’s E-tank is an elutriated sludge tank that not only has its contents slurrifed by injecting water from below, but is vibrated at 180 cycles/second to prevent ‘hard-cake’ and to ensure that particles are distributed throughout the depth of the slurry by density, not by size. According to test results in Ralph Graefe’s patent,the device can recover 100% of gold as fine as 70μ, falling slightly to a very impressive 93% of 30μ gold. Thetest results show a 60°slope to the walls of the tank recover far more fine gold than a 45°slope. The patent states 7-8 gallons/minute (1.6-1.8m3 /hour) is required to process coarse material, and only 1-2gallons/minute (0.2-0.5m3 /hour) to process fine material. A little additional water is required from a hand-held spray bar to inhibit hard-cake from forming. Gold larger than 75μ sinks to the bottom of the tank to await batch discharge. But <75μ gold is carriedtowards the spillway lip and so a skimmer plate is weldedon to prevent it escaping.Batch discharge is rather cumbersome. The tank isprogressively tilted more and more steeply to dischargeits upper contents as tailings. Then the residualconcentrate flushed out with water by opening the bungin the discharge pipe in the base of the tank. The Pyramid E-tank was invented in the early 1990s by Pyramid Industries of California and marketed as the Pyramid Rotary Jig®. Manufacture ceased and an advert is the sole source of data, but it seems to be an elaboration of the ‘Heavy Mineral Separator’ invented by Laurence H.Konvalin of California, patented in 1983 (US #4,389,309). The Pyramid E-tank lacks jig screen, jig bed, ragging, hutch chamber or vertical jig motion. The advert stresse sit differs from hutch jigs and diaphragm jigs. 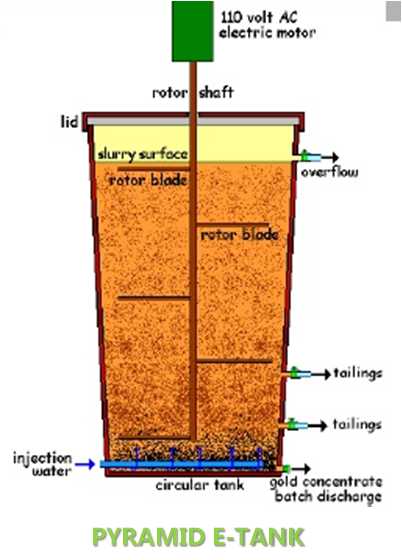 Rather the invention belongs to a family of gravitation devices termed ‘elutriated sludge tanks’ (E-tanks) that seem particularly suited to recovering very fine gold.The Pyramid Rotary Jig® is here termed the ‘PyramidE-tank’. Model #T50 consists of a circular tank tapering from 22-inch diameter at the top to 18-inch diameter at the bottom. The taper is said to be significant. The tank is first filled with screened material – how much screening is unclear. When the tank is full of sediment, pressurised water injected from below – how much pressure is unclear. As with other E-tanks, littlewater is required. Water consumption varies with the gold size to be recovered – 2mm gold requires 2,725 litres/hour for a through put of 4 tons of solids, down tovery fine gold (<100 μ) requiring 454 litres/hour for athrough put of 0.9 tons, and for the finest gold 114litres/hour for 0.5 tons of solids. Once the pressurized water is added, the stirrer blades are able to begin to rotate – how fast a rotation is unclear. The blades are simple metal bars welded at intervals along a central solid metal bar that acts as the drive axle turned by a 110-volt A.C. electric motormounted above the tank. The device is innovative in slurrifying by rotary stirring. The gold and other heavy particles spiral down, while the lights spiral upward. This seems to be in thixotropic sludge-like slurry. After several minutes of operation, the barren tailing sare bled through the tank wall via drain taps at two levels.Then the tank is refilled and the process repeated “over and over again” until an “ultra-rich concentrate” is achieved. A concentration ratio as large as 2000:1 is possible and the concentrate is removed from the bottom of the tank via a concentrate tap as a batch discharge. Continuous operation is possible with automatic feeders.